Stephen King’s Christine was about an evil car that terrorized people. Now we have a Titanic replica that may be haunted. Wyatt Jason Moore (aka Chuck) built a nine foot long Titanic replica that looks pretty cool complete with crewman, children playing on deck, ladies in period costumes and even someone walking a dog. But when he examined photographs of the replica he began noticing something not easily seen by the naked eye. An unexplained image in the portholes just above the life boats – on the port side of the vessel. According to Chuck, it looks like a bald headed man with a handle bar mustache looking out. And he just recently identified a woman in one of the portholes appearing to lean forward to see the view. So let me understand this. These are ghosts peering out of small portholes on a Titanic replica that can only be seen by examining photographs. Sort of like those ghosts that can only be “heard” when you leave a tape recorder around a graveyard or old house. Well the good news is that he intends to partner with a museum so the Titanic replica will be heading there. So if the ghosts decide to get more active, it will be their problem and not his. On Donegall Road in Belfast is now a large mural dedicated to Titanic. 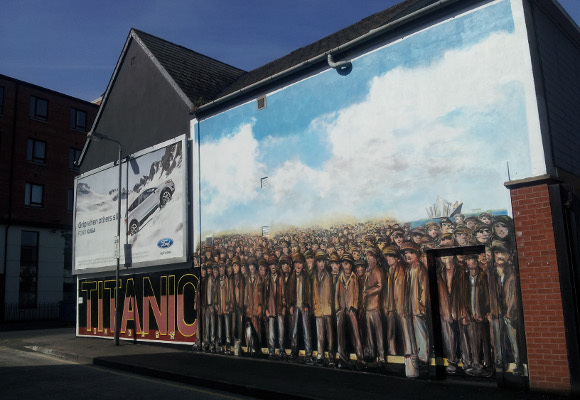 According to Inside Ireland, the mural is to honor Belfast workers who built Titanic. Pretty cool.